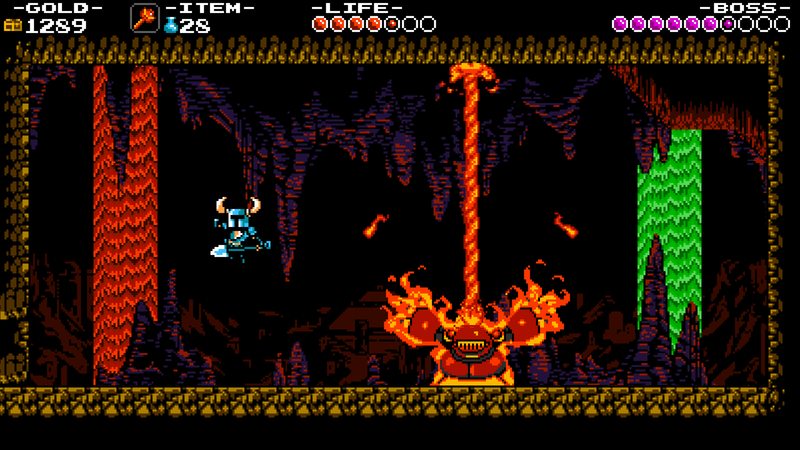 Was Shovel Knight an epic masterpiece or were Yaught Club Games digging them selves a very deep hole? Shovel Knight and Shield Knight are two adventurers who formed a strong relationship with each other, together they would adventure across many lands and discovering many treasures on their travels, one day they tackle the tower of fate seeking a magical amulet, unfortunately the amulet is cursed and upon its discovery Shovel Knight blacks out and awakens outside only to notice that the tower has been sealed and Shield Knight was no where to be seen. 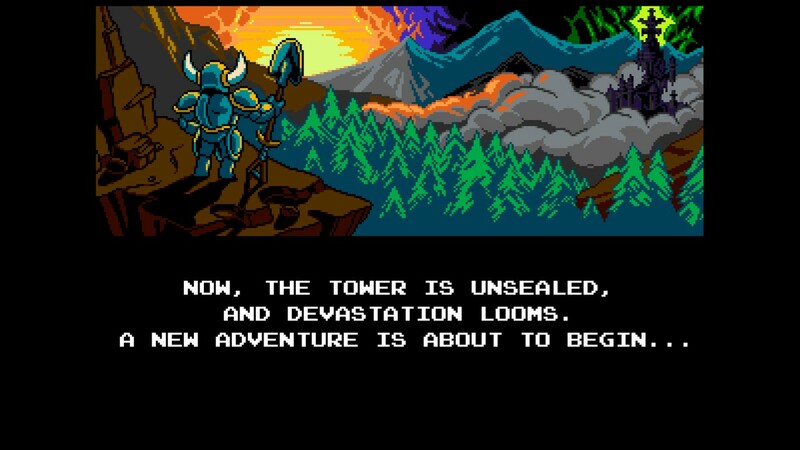 Grieving the loss of his beloved, Shovel Knight gave up his life of being an adventurer and went on to live in solitude, with Shovel Knight gone an evil sorceress called The Enchantress gathered the Knights of the Order of the no Quarter and they started to wreak havoc on the land, Shovel Knight discovers that The Enchantress had unsealed the Tower of Fate and is using it as her new castle, Shovel Knight decides that the only way to save the land is too defeat The Enchantress in the Tower of Fate and to hopefully reunite with Shield Knight. Shovel Knight plays and feels very similar to three very popular old school Nintendo classics, Duck tales on NES, Mega man and Super Mario Bros 3. 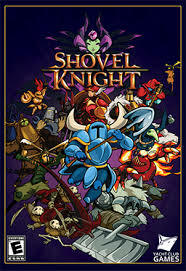 The game is a 2D action plat-former, players will need fight there way through each world using their shovels to their advantage, unlike a traditional Mario game players can not defeat enemies by simply jumping on them as this will cause Shovel Knight to take damage, instead you will need to use your Shovels to bounce off of your enemies you can also hit enemies with your shovel similar to using a sword. 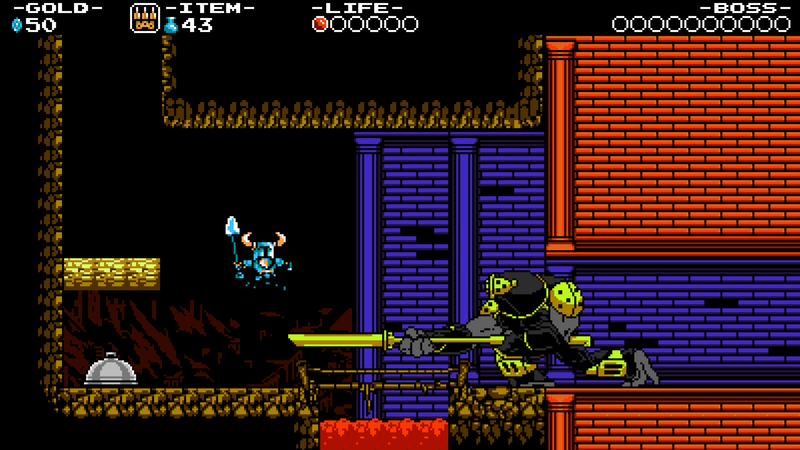 Of course your shovel isn’t the only weapon Shovel Knight can use as there are also items called relics which can prove to be quite useful in the more tougher areas of the game, you can either buy these items from a merchant in town and some items can only be bought by secret merchants hidden each knight level. 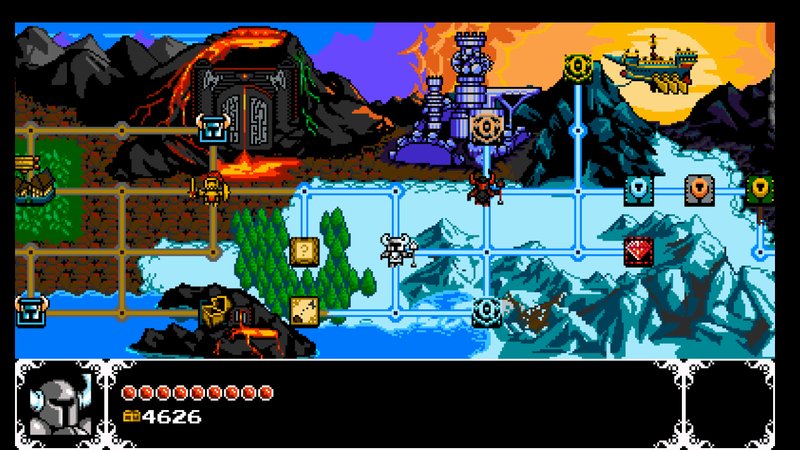 Shovel Knight uses a map system which draws inspiration from Mario 3, this doesn’t surprise me as Mario 3 perfected the formula for over world maps in video games and in turn many developers choose this style due to that games success, with that in mind it should be no shock that Shovel Knight follows this formula having the player needing to defeat certain levels to unlock new paths, bumping into other adventurers who want to duel and entering towns to stock up on items. There are eight knights that you will need to defeat before you can gain access to the Tower of Fate Spectre Knight, King Knight, Treasure Knight, Plague Knight, Mole Knight, Polar Knight, Tinker Knight and Propeller Knight, every time you defeat of one of these knights a new path on the overall map will open allowing you inch closer and closer to the Tower of Fate each time. You may also bump into wandering travelers on your journey, these travelers will fight you if you cross paths so be wary of which path you take. 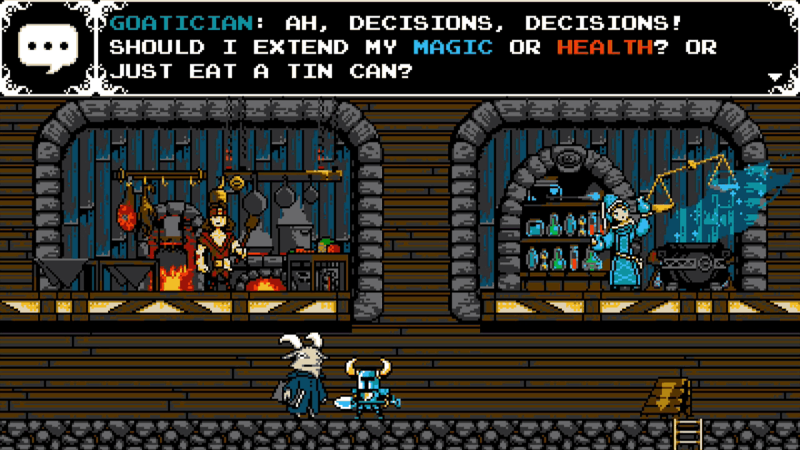 Towns will prove to be very important pit stops on your quest as they will allow Shovel Knight to buy new weapons and armour as well as to increase his maximum health and magic, it is also a good idea to speak to the town bard as he will buy any music sheets that you have found while adventuring. 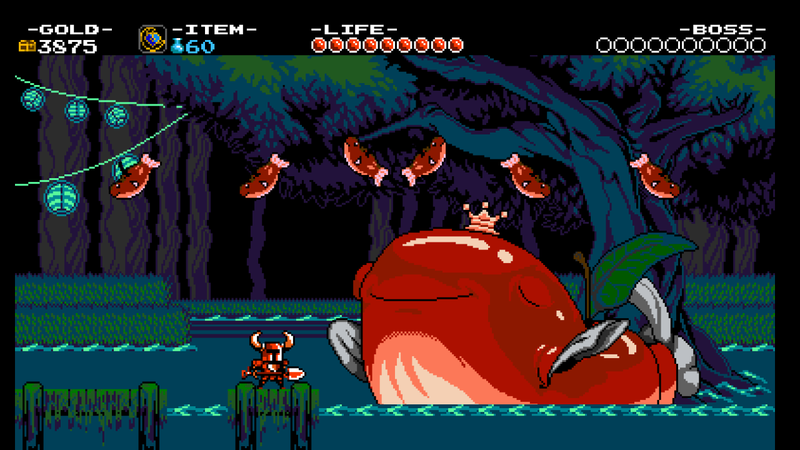 Meet the Troupple King this cross between a trout and an apple will surely prove to be the most useful stop in the entire game, the Troupple King has the ability to create ichors which Shovel Knight can drink. These ichors come in three colours. Make sure you choose your ichors wisely as you can only hold two at a time, also in order to use ichors you must buy a Troupple Chalice or two from the apple man in town. 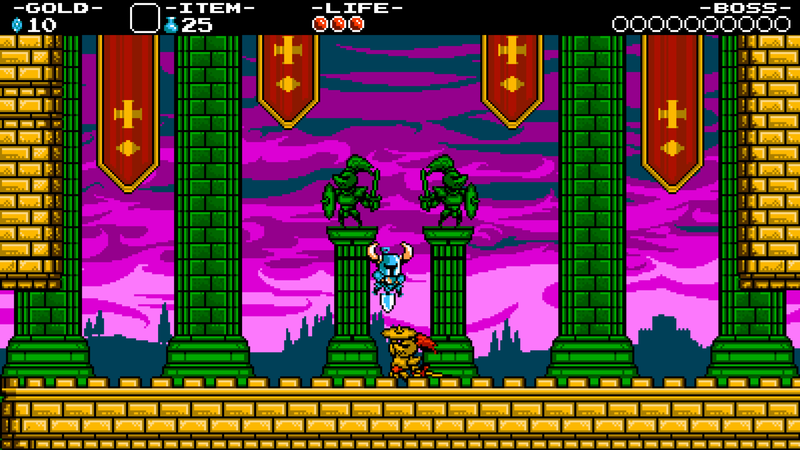 Visually Shovel Knight is stunning it has a similar art style to the Nintendo Entertainment System using what appears to be 8 bit visuals, of course there is no way Shovel Knight could run on the NES due to how fast the game runs as well as its large color palette. The soundtrack is absolutely perfect for this style of game, its beautifully composed and there is not a single track in this game that I do not love, its not just the composition of the soundtrack but its also the direction that really helps create such a wonderful game play experience, each section of the game has what I consider to be the perfect choice of music for example when the game is intense the music is intense, when shovel knight is dreaming the music is still a lot of fun but its much slower and when your in towns the music is cheerful and a little silly which suits the towns superbly as the towns people are wacky and unusual. Shovel Knight is a fantastic game and for a project that was only possible due to crowd funding it’s absolutely amazing, make sure to visit the hall of heroes to see paintings of all of the crowd funder’s as well as a secret boss fight. 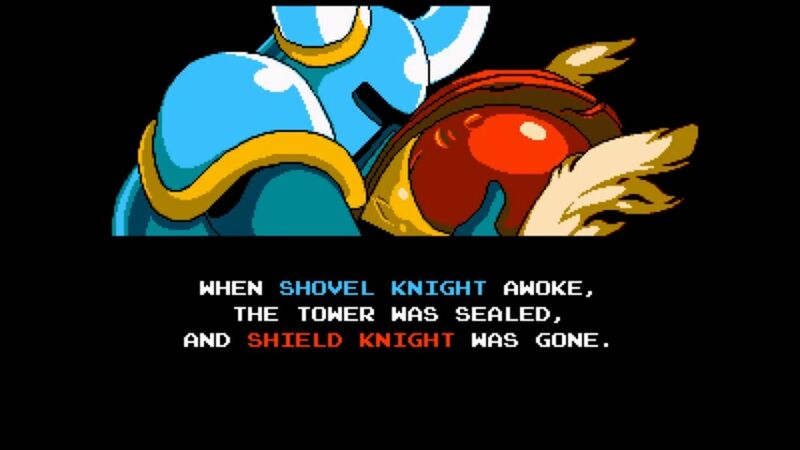 I don’t what to say apart from that the game is perfect and as an extra treat when you beat the game you will unlock extra challenges that you can complete and in a more recent update a brand new game called Shovel Knight: Plague of Shadows has been added for free and is also available upon completion of Shovel Knight.